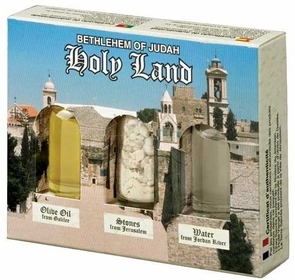 This gift pack from the holy land contains three flasks, each with a different sample of oil from the galilee, holy water from the Jordan river and stones from Jerusalem. This allows one to feel close to the holy land in a symbolic way, and give us strength to ask for protection and inspiration from heaven. Sometimes, a small inexpensive gift can do wonders to open the sincere Christian heart. The box is decorated with the Church of Nativity in Bethlehem which creates an even more special feeling. Thanks to modern technology, the world of the spirit also benefits. Thus, this gift becomes available to you here, directly from the holy land, to use in the way best for yourself or your close friends and family, to come closer to God. Make yourself spiritually stronger by purchasing this Christian gift. Use this item to strengthen and inspire yourself and others so that the through modern technology, one may be blessed with the feeling of the presence of the holy spirit. This Christian gift can make a world of difference if used sincerely and with pure intentions, showing that ultimately the most important things in life are still available for the taking, all we need to do is ask.